For the record, I think Au Pear is up there with daft names for restaurants. It doesn’t beat a restaurant in Leeds that was called @Larocca (it no longer exists – it wasn’t very good in the food department) but it is still a bit confusing. Have they spelled something wrongly? Is it (as someone asked on twitter) a restaurant that will look after your children while you dine? What exactly are they trying to tell you? Branding aside, I guess a lot of this doesn’t matter very much if your restaurant delivers and restaurants in the McLaren Vale/Willunga region have to do that because there’s a lot of excellent competition. Au Pear is on a tough patch because it’s located on the road from McLaren Vale to Willunga, and in between Fino and The Kitchen Door at Penny’s Hill. As my parents are our chief babysitters their payment in kind is being taken out to lunch. I’m quite a long way behind with what I owe them but you have to catch up somewhere. We’d been planning on trying out Au Pear a while back but a sick toddler had curtailed that exercise, so it was a relief to actually get there on a lovely sunny day, complete with toddler and at least one Octonaut in tow. Au Pear is smallish space, with a semi separate area for the bar and a dining area. It sits somewhere between café and restaurant and I’d describe it (ambience wise) as more casual than both Fino and Penny’s Hill. Both the menu and the wine list are short and sweet. I always rate short when it comes to menus and, unsurprisingly, the wine list has a strongly local focus. We chose a La Curio Sangiovese and dad also had a Goodieson’s beer as apéritif. The food is all simple and self explanatory, which leaves the kitchen very little room for mistakes, because it’s likely you’ll have quite definite expectations about what you’re going to receive. For entrée (although this choice came from the ‘starter’ section of the menu, ‘entrées’ were listed separately) I chose the vine leaves stuffed with rice, pine nuts and mint and served with labne. This was a generous portion, with two large rolls on the plate. I love the combination of mint and labne and I really enjoyed this dish. The vine leaf rolls were tender, juicy and the mint definitely came through and there was ample labne on the plate. 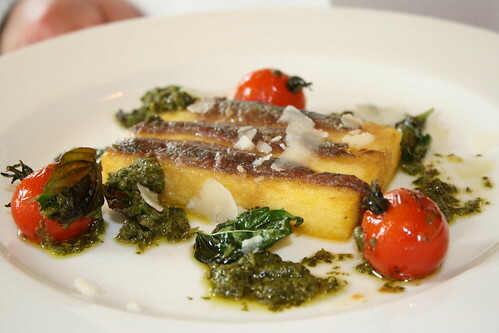 Dad ordered the polenta, fried and served with anchovies, blistered trussed tomatoes and basil and mum chose some cauliflower fritters. 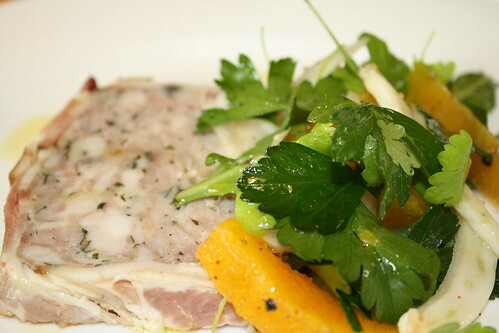 For a while now we’ve been sensing that sharing our food with the toddler leaves us hungry, so for him I ordered the game terrine with orange and fennel salad which lasted him almost the whole meal but definitely got the thumbs up (apart from the parsley). 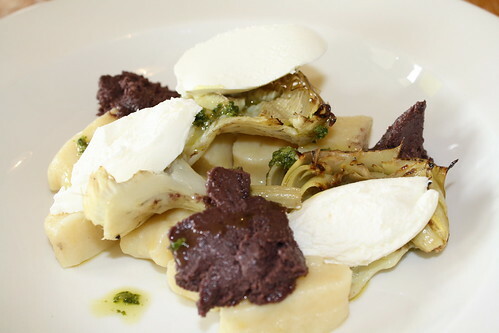 For main course I ordered house made gnocchi served with caprino fresco (soft, fresh goats cheese), marinated artichokes and black olive tapenade. While the gnocchi and artichokes were warm, the cheese and tapenade were cool so there was an interesting play of temperature rather than texture. I absolutely loved the fact that the three main components hadn’t been blended to form a sauce (not that that wouldn’t have tasted great): it was a very fun way of serving a very simple dish. And I’m pleased to report that the gnocchi were light too. The service was really friendly and efficient and both the owner and our waitress were really considerate, thoughtful and friendly people who went out of their way to ensure that we were comfortable and well looked after. 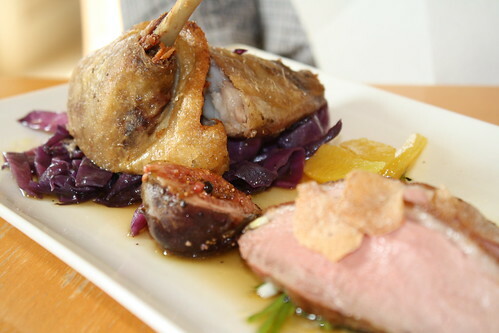 I would not hesitate to return to Au Pear, or to recommend it. I think that both its ambience and style of food fit really well, in a complementary way, with its near neighbours. 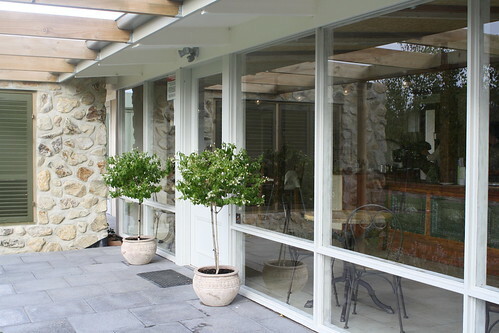 At present it is open every day for lunch and open on weekends for breakfasts. And one final hint? Make sure you go to the loo while you’re there: it’s a stunning inside out set up!